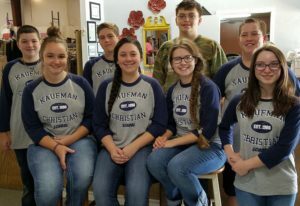 High School students from Kaufman Christian School spent the first Friday of each month this school year serving at the shelter. This is the 5th year KCS has partnered with KCCS to allow our students to give back to their community. KCS students spent 2 hours each Friday doing various chores from cleaning to laundry to stocking shelves. The goal is to give the shelter staff a break and allow the students to serve those who always serve. Servant leadership is a part of the core curriculum for upper school students at KCS and we are grateful to Mrs. LaReta and her staff for allowing us to serve alongside them!